So I watched the last episode of Sherlock - Season 2 episode 3 last night, for the second 1/2 time. Don't judge me, and I promise I'm not in obsessing mode. Fortunately for you all, I only have room in my heart for one fangirl topic at a time, and tumblr keeps bombarding me with emotionally compromising THG stuff. "The name is Sherlock Holmes, and the address is 221B Baker Street." I started watching this series sometime...eh...late November? and became addicted, frantically waiting for Season 2 to come out. It did, and I watched that too. In my opinion, Season 2 isn't nearly as good as Season 1, but it comes close. Very close. This is probably my favourite Sherlock Holmes adaptation. To be brutally honest (and I know some of you will want to have me burned for heresy) but I don't think Rober Downey Jr. is all that fantastic. Actually, he sort of creeps me out, and his British accent leaves something to be wanted. The movies are good, and I enjoyed them, but they just...aren't Sherlock Holmes. Benedict Cumberbatch, while still a teensy bit frightening to me because of his role in Atonement, is an amazing Sherlock Holmes. He does the "high-functioning sociopath" thing perfectly. 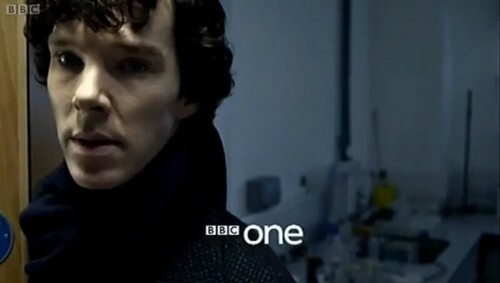 Cold, calculating and emotionless, which is what Sherlock is supposed to be. Except in the company of his only friend, Doctor John Watson, who is played by Martin Freeman. "Yes, yes of course it was." Martin Freeman is a great Watson. He's surprisingly tolerant of Sherlock's irritating quirks. He does lose his patience every once in a while, but eventually, the two become so close that John becomes a sort of conscience to Sherlock. Anyway. The Season 2 finale is very emotionally painful, and I can't believe that I have to wait a whole year for the cliffhanger to be resolved. This is not to be borne. But since both Martin Freeman and Benedict Cumberbatch are only unavailable to shoot Season 3 right away because they are in The Hobbit, I can forgive them. I spent the night after I first watched the finale, lying in my bed, weeping, and trying to come up with ways that...well I can't tell you what, if you plan on seeing it, I'll spoil it. But I was trying to figure out how to solve the cliffhanger, and that is a recipe for lack of sleep. The next day was very painful. It's very well done. The plots are all fantastic and lots of fun. They show Sherlock's calculating side very well. When he looks at a person, a line of text shows up wherever he's looking, saying things like "smoker, married, date tonight, has three dogs..."
The acting is all amazing, even the small parts (with the exception of Lara Pulver, who plays Irene Adler). I love British acting. They incorporate little tidbits from the books, so I can go "Oh! I remember that from the books!" The music is fun. Really fun. It has one of the best played villains I've come across. A nice mix of crazy and flirty and devil-may-care and cold. It's suspenseful. Don't ever watch this late at night alone in bed under your covers with your mother's iPad. They're gripping. It's pretty much impossible to stop halfway through. Physically, yes. Mentally? Forget it. Ok, that's it... I need to watch this. Now. All the best things come out of Britain, don't they? I have a fan crush on Downey...but when it comes to playing my beloved Holmesie (which goes beyond a fancrush) I despise Downey with my heart. He does not resemble, act, or behave (which is the same as act. duh) Sherlock Holmes. I agree 101%. Question here, I haven't watched these yet, but I want to however. Is there anything I need to watch out for between Watson on Holmes? No bro-mance, right? That is the biggest reason I haven't watched the two S.H movies with Downey in it. Not the only however. Downey has no right to play as my beloved Holmsie. Ashley: Nope, none of that, thank goodness. After the first season, I was afraid there would be, since there as HUGE pressure from fans, but there is nothing you can only interpret as "bromance." I'm SO SO SO going to have to persuade my parents to let us watch these. Oh, would it be fine for kids, Gwenea? And then Season 2 episode 2 is The Hound of the Baskervilles, so it's a bit scary. Other than the fact that it's kind of frightening, I'd say it's appropriate. All of season 1 is clean. Good! HOBv...I love that book/show. Have you ever watched any of Basil Rathbone's S.H movies? I have not, the only Sherlock Holmes adaptations I've seen are the R.D.J. ones and these.